They're not that bad, but they're not that good either. 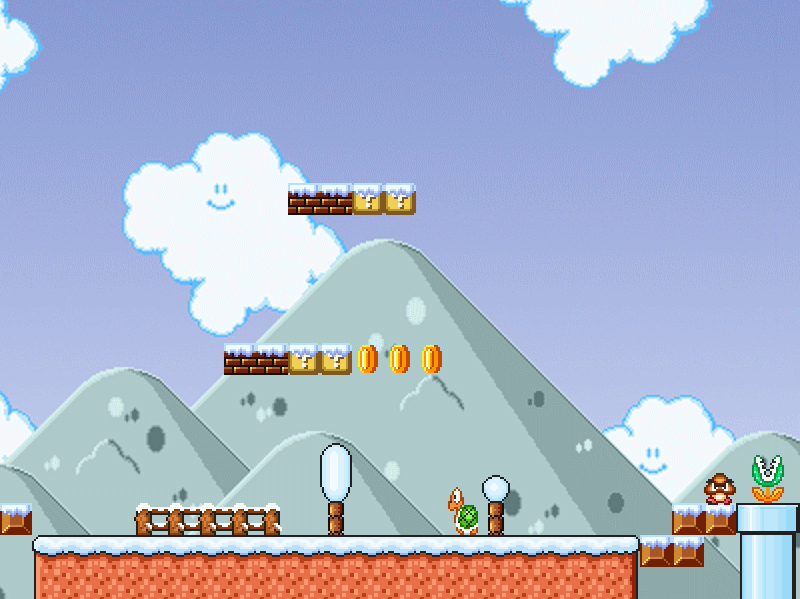 An original SMB1 styled snowy level WITHOUT any slippery blocks. To make it more SMB-like, no slope is added here and any landscapes may be able to be remade on the SMB1 platform. Seems like an okay level, but you can just run to the right. Not really much in the way that's challenging, and there's not much to see anywhere in the level. There's not too much wrong with the level - though some of the blocks seem a bit too high to get powerups - but there's not much going for the level. Try adding more of a challenge, and making the level a bit less linear so you can't rush to the end. As long as one man goes hungry nobody should eat until everyone is full. Alrighty so your graphics are pretty good, but throughout the level there's cutoff with some of the pipes. I also recommend recoloring the piranha plants and maybe even the goombas, but the piranha plant's color stood out more as unfitting to the level environment. 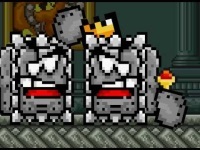 The smb1 visuals are relatively limited, but you made do with what you had and you utilized them pretty well. I felt like I was playing an smb1 level, so I commend on creating that kind of atmosphere. The game play was really simple, and it was left relatively bland. Linear levels can be very enjoyable, but you need add more to create a greater challenge that the player can enjoy. The level doesn't have to be super difficult by any means, but anything that gets the player thinking and/or doing more than moving through the level is good if done right. The piranha plants could've been utilized more, and you could probably use another piranha species if you're willing to, just make sure not to spam. The poison mushrooms were a decent touch, but the last one towards the end of the level has no purpose being there. If it's harder to actually touch the poison mushroom than to avoid it then you're not doing something right. I will say the level length is pretty fair, and there's no need for a checkpoint so that's nice. Lastly the glaring issue is you have a lot of blocks placed too high. I was able to barely get up there as Luigi, who has the highest jump, so lowering them will help your level out. So overall this isn't a bad level, but it doesn't have that replayability yet.